Fireworks Frenzy LLC has a huge selection of over 250 fireworks ranging from novelty to professional grade. Our superstore has the largest selection of high quality, competitively priced fireworks in East Texas. We are ready to assist you in designing a heart-stopping, thrill-packed evening for you, your family, and the entire neighborhood. 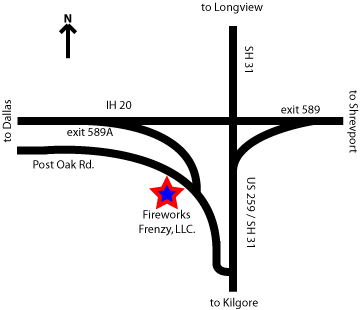 Fireworks Frenzy LLC is located on I-20 at Highway 31, on the interstate between Longview and Kilgore Texas. As always, remember to save the UPC codes from Black Cat aerials and fountains, send them in with your receipt, and receive free Black Cat accessories. Cash and all major credit cards. forth mile on the left. but before I-20, turn left onto Post Oak Road at the Church of Christ. Copyright © 2007-2012 Fireworks Frenzy LLC. All Rights Reserved.